On July 2, 2013, Google killed Google Reader. While I have used Google Reader on and off for years, I don’t use it now. However, I still know and care about the value of RSS as a publishing syndication platform and feel that Google has hurt that by creating a monopoly of sorts by buying up RSS apps then killing them. It’s not the RSS reader. It’s the open publishing ecosystem. Most clients point to Reader as the central feed aggregator. Most publishers point to Feedburner as the central publisher. Google seized the commanding heights with Feedburner and Google Reader and captured all the publishers and the clients, and now they’re killing the ecosystem. I don’t see why they couldn’t have integrated Reader into Plus without killing the ecosystem. Twitter, Facebook, LinkedIn are moving into news aggregation, and Google is killing a successful news aggregation system. I don’t understand their strategy, but it’s seems sort of like, we want everyone on G+ and we don’t care how heavy-handed we look or how early adopters feel, and we don’t want an open ecosystem that people can use to pipe content into Twitter and Facebook. I definitely still use it. I probably will wait until the last week of June to commit to a new solution. I’ll probably go with Feedly, but I’m not sure if they let you pick any website, etc. Also, I don’t know how they accommodate custom searches [like Google Alerts]. I’m going to wait until there is an opportunity for a mature alternative. I also have questions about how the web will attempt to syndicate in the absence of Google reader. I know people are saying that the shuttering of reader is a pronouncement of Twitter winning vs. RSS. But, Twitter isn’t an adequate replacement for RSS and leaning on newsletters is a step in the wrong direction. I’m all questions and all ears. http://miniflux.net/ – a minimalist web based news reader. And if that list isn’t good enough for you, NPR suggested Digg. Microsoft Outlook also has a RSS reader and some Internet browsers have RSS readers built-in. Did you know Internet Explorer 9 had an RSS reader? Firefox requires an add-in like Simple RSS Reader, Feedly, or Sage. Same for Chrome. AOL also has a RSS reader aptly named AOL Reader. I remember the first time I saw Google Reader. A coworker had invited me over to his house and while there he told me he wanted to show me something cool. When I walked over to his computer he proudly showed me how he had collected all of his favorite information into one place. He was able to sort through article after article with the spin of his mouse wheel. It was glorious. I signed up for my own account and quickly began adding RSS feeds from sites I wanted to follow. I quickly became inundated with more articles than I could read in a day. I started to get discouraged and eventually I quit. RSS is not a curator of content, it’s an aggregator of content, but sites like Reddit and Hacker News are kind of both. Articles are collected there and self-curated by the community. Compare this to Fark, which is a news aggregator curated by Drew Curtis. What RSS doesn’t do is filter out all of the mediocre or non-relevant articles that inevitably appear over time no matter how targeted the blog. Far better to find a community around a subject you like and have articles aggregate and share there. This is the difference between Twitter proper and Twitter lists. The former is mostly noise and the latter is much more concentrated. Apps like Hootsuite can also help curate with search lists for keywords. 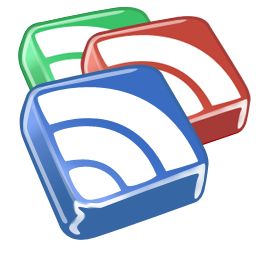 RIP Google Reader. Long live RSS. 4. promote your RSS feed of the mp3 file through one of these podcast submission services (iTunes would be the most popular choice). 5. Listeners “subscribe” with podcast client application to your RSS/Atom feed and download new files automatically.